Distribution. Southeastern US to Alaska. 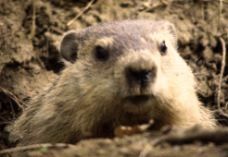 Woodchucks are the least social of all marmots and are widely distributed in suitable forest edge habitat. They are primarily active about seven months a year but may, weather permitting, be seen most months. Woodchucks produce about four young and virtually all females breed annually. Young mature quickly and generally disperse in their first year. Adults don't interact much--males may mate with the one or more females whose home ranges they overlap. When found around fruit trees and gardens, woodchucks are classified as agricultural pests. They rarely alarm call but their two loud calls probably function to warn dependent offspring. A call recorded from a captive woodchuck is available.